Form 990 is not just an IRS Form but a publicly filed document and some nonprofits forget they can use it as a fundraising and public relations tool. With the economy being down and donations getting harder and harder nonprofits need to look in unusual places for donations and use whatever free tools they have. The Form 990 filled out correctly with the collaborations of the fundraising, marketing and accounting department, together can achieve this and attract donors. A big mistakes is to leave preparation of Form 990 to just the accountants and auditors it must be a collaborated effort. While coming up with the data to enter remember donors look at the Form 990 to educate themselves about charities they are thinking of donating too assessing what accomplishments and how prior donations were spent and will be spent. 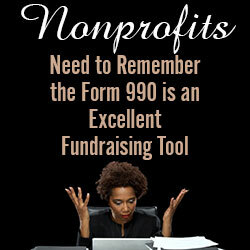 To make the Form 990 a fundraising too tool and use it to increase public awareness of your nonprofit organization always clearly explain the purpose of the organization and its recent accomplishments and attach promotional information to supplement statement of program service accomplishments. Think of the Form 990 as a presentation everyone can see showcasing whom and how many people your nonprofit has helped. Include how many volunteers were use to accomplish your achievements. With how much money was raised and disbursed with clear statistical results. By doing this it gives potential donors confidence that their money will be used appropriately. Filling in an IRS tax form isn’t everyone’s favorite thing to do, however for nonprofit organizations need to think out of the box and see a marketing opportunity, as they should in everything even if it is in the most unusual places.